Mix - 1 teaspoon of acrylic paint + 1 teaspoon of mod podge/Elmer's glue + 1 teaspoon of water. Let them blend thoroughly. Use a paper towel and wipe off any paint that may have dripped onto the outside of the jar. Use a wet paper towel to make it extra clean. Let it dry. The lesser the paint inside the faster it drys. The bottles took 2 days to dry. When I tried a Google search for Jack-o-Lantern faces, I got some cute templates from Martha Stewart, here and ideas from Crafts by amanda, here. 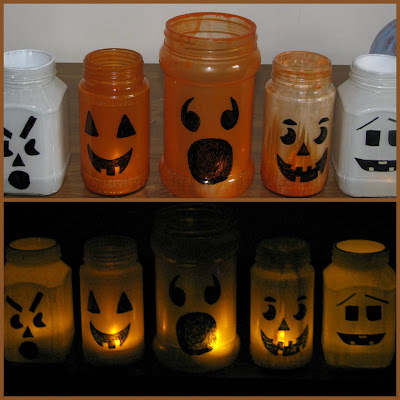 On the Orange glass jars, I just free handed the faces with permanent marker. For the ghosts jars, Since I thought of reusing the jars as vases, I used masking tape for the face. First I free handed the expressions on the masking tape and cut them out. After placing the tapes on the bottles, CJ colored them black with the markers. Illuminated with LED tea lights! That's a great idea! I must try to coax my girls to do this project, but I don't think they will budge from the pumpkin decor! Anyway, will try! Those turned out super cute! I'm quite fond of the ghosts. Thanks for sharing! Ooh what a neat way to paint the insides! Your lanterns look great! Those are VERY cool! How creative & I love reusing stuff =-) Thanks for linking up to Living Life Intentionally Linky Party so we can all be inspired!! These are awesome! I found you through Creative Jewish Mom. Thanks for sharing! Pinned this one! They are so cute. Plan on getting these done this week. I love the way these turned out. Very fun! Thanks for sharing your link on ABC! I normally use glass paints on the outside.. but this is simply impressive.. Thanks for coming in and linking in to the party..
Beautiful... !! Thanks for linking in ! !